Colombia, with its three Andean ranges, vast jungles, coastal mountains and both Caribbean and Pacific coastlines, is a country made up of incredible panoramic views. 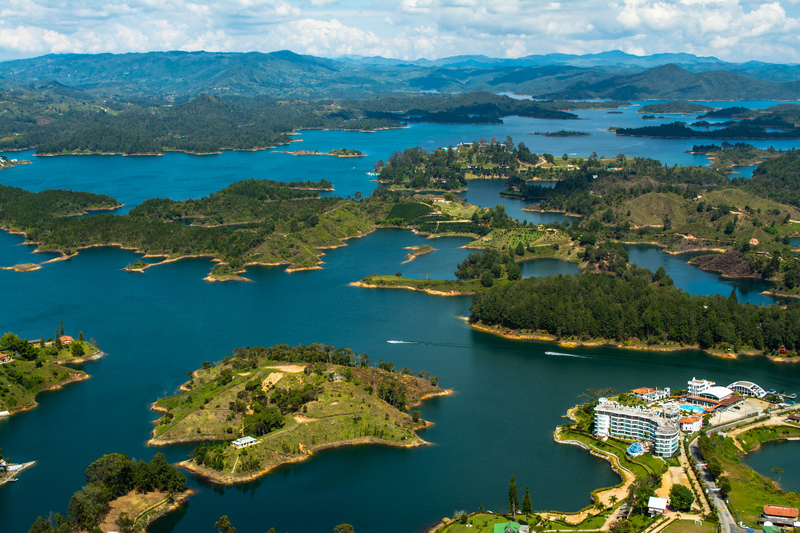 From the heights of the Andes to the breathtaking vistas over endless swathes of untouched jungles, here’s where you can see the best panoramic views on your trip to Colombia. Perhaps Colombia’s most iconic viewpoint is Monserrate, a mountain rising to the east of Bogotà topped by a church. 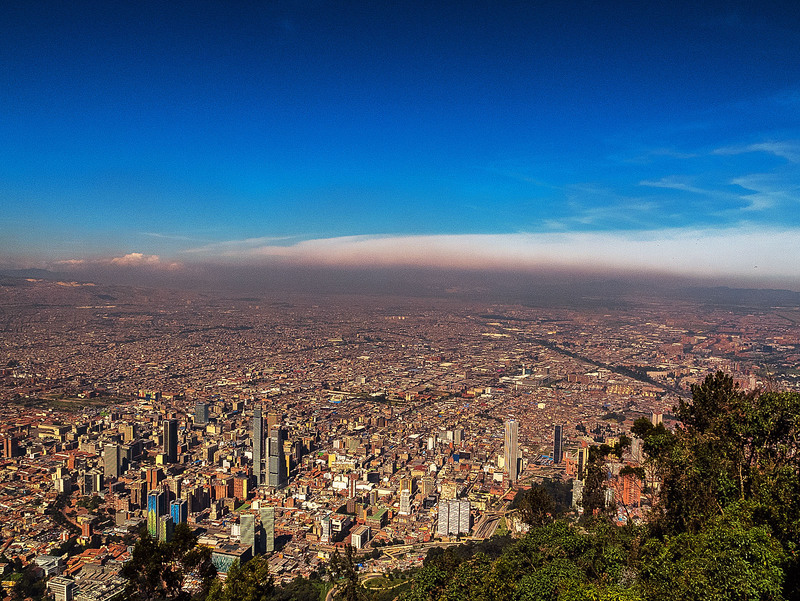 Accessible via cable car or funicular railway, Monserrate’s epic panorama of Colombia’s capital—even of the distant snowcapped Andes volcanos on a clear morning—is pretty much unbeatable if you’re looking for a city view in Colombia. 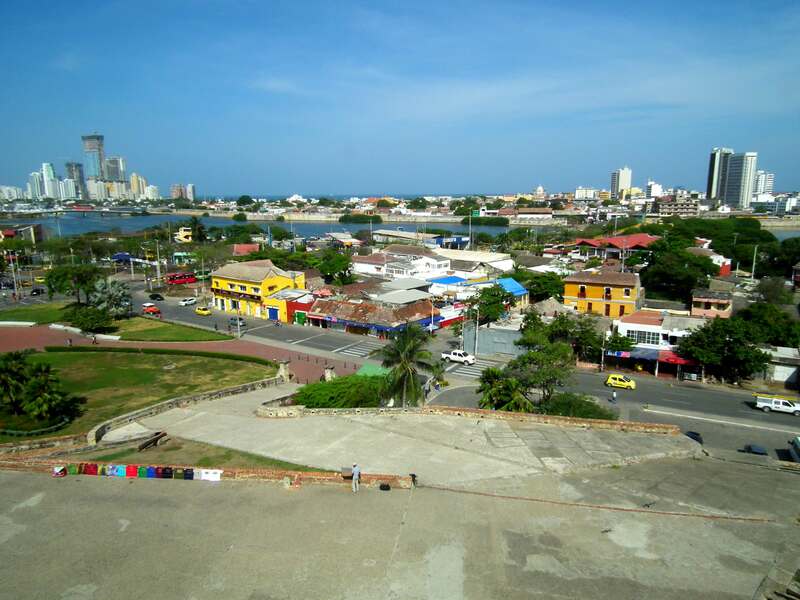 This Spanish colonial castle in Cartagena is worth visiting for its history and architecture alone, but perhaps its real selling point is the beautifully contrasting panorama it offers against both the old walled city and the new, chic skyscrapers of Bocagrande, all surrounded by the beautiful blue Caribbean waters. There’s no better view in Cartagena (though the one from La Popa Monastery is pretty special too). The classic panorama of choice for backpackers on the Caribbean coast is from Casa Elemento, one of Colombia’s coolest hostels. Perched on the edge of a mountain in the Sierra Nevada de Santa Marta, the hostel’s giant hammock overlooks a stunning panorama of jungle-covered mountains, the Caribbean Sea and even the distant city of Santa Marta. A short hike up the hill also reveals more dramatic views over the snowcapped peaks of the Sierra, the highest in Colombia. One of Colombia’s most famous 360-degree views is from the top of El Peñol Rock near Guatape, a pretty lakeside village a couple of hours from Medellín. After 740 steps, visitors reach the top of the rock to be greeted by an unsurpassable vista of sparkling blue waters and hundreds of green islands, with the peaks of the Andes surrounding them. This small conical hill jutting out from the Carribean in the coastal desert region of La Guajira is a sacred place for the local indigenous Wayuu people, and when you see the view from the top, you’ll understand why. The 360-degree panorama takes in wild desert landscapes, endless blue ocean and the jagged, rocky coastline of La Guajira—it’s easily the best viewpoint in the region. 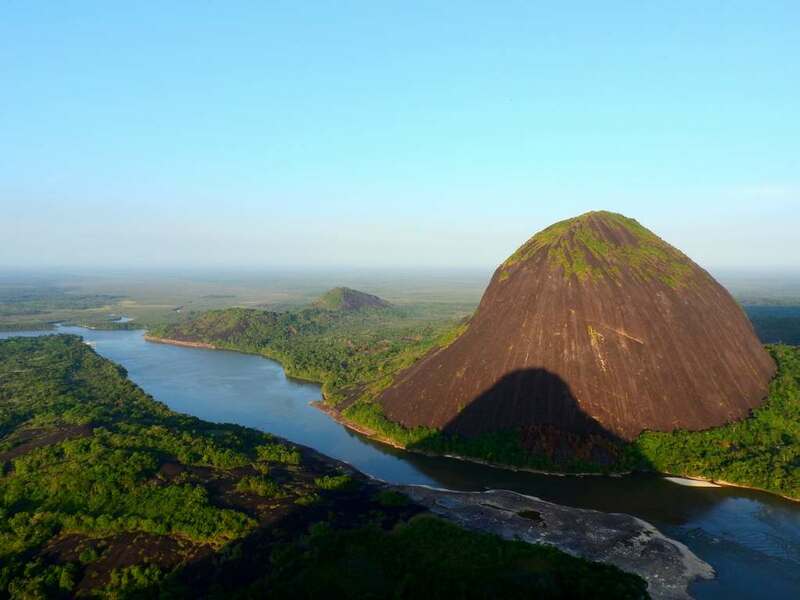 Colombia’s most dramatic jungle panorama is the view from the top of Mavicure Hill, one of the three hills that make up the jungle rock formations collectively known as the Mavecure Hills, or Cerros de Mavecure. 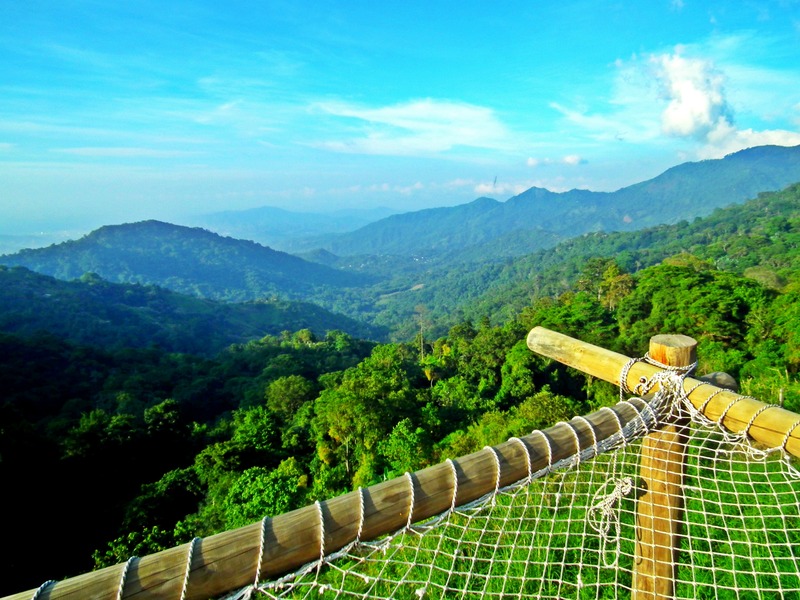 At 170 metres (560 feet), Mavicure offers incredible panoramic views over the untouched jungles of the Guainia department, as well as an epic view of its two neighbouring hills. If you want a beautiful jungle panorama, then this is where to go in Colombia. This giant statue of Jesus (think ‘Christ the Redeemer’) overlooks the southern Colombian city of Cali and is one of several excellent viewpoints from the mountains surrounding the city. The hike up to Cristo Rey makes for great exercise, but the real reward is the epic view over the entirety of Cali, which stretches out as far as the eye can see. This town, whose name translates to ‘good view’ in Spanish, really lives up to its name! Buenavista is perched on a ridge in the heart of the Zona Cafetera, Colombia’s coffee region, and offers amazing views over the central Andean plain with the jagged peaks of the Western Range visible in the hazy distance. 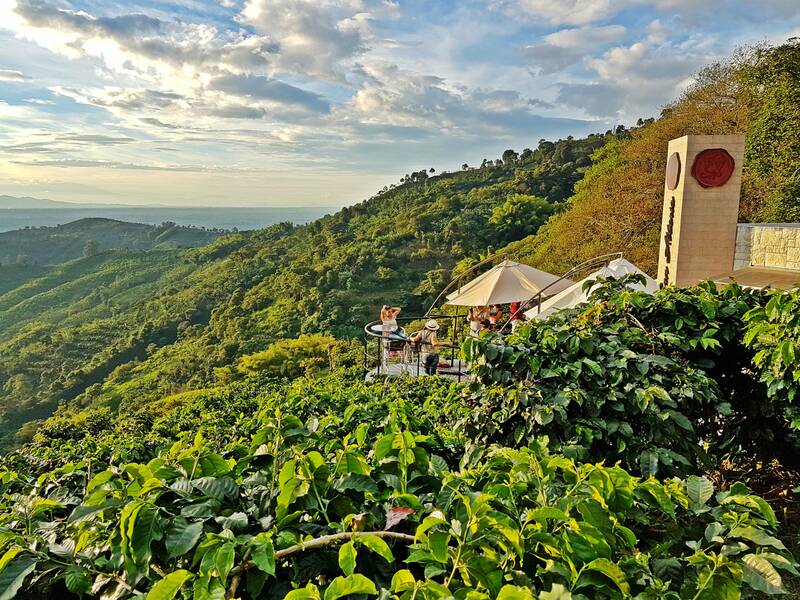 The best place to enjoy the view is from the terrace of Café San Alberto, where you can enjoy some of Colombia’s best coffee while taking in one of the country’s best views.